How beautiful and trendy! A piece of artwork for your kitchen. 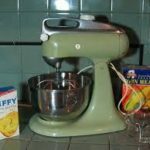 The other day as I was whipping up a lemon chiffon cake in my Kitchen Aid, I felt this rush of love and adoration for this appliance that has been the stronghold of my various kitchens for over 37 years. I know it sounds crazy to be in love with a kitchen appliance but really, it’s about the stories it harbors. The Kitchen Aid has assisted me in making pasta, grinding meat, kneading dough along with basic mixing for cookies. This work horse deserves a tribute. It’s a family love affair. My mom purchased her first Kitchen Aid in the early 60’s after being enticed by the ads in her cooking magazines. An avid cook with a fetish for cooking gadgets, the latest avocado green Kitchen Aid soon graced her kitchen counter, matching the decor of bold blossoms of orange, yellow and green wall paper that peppered her kitchen. Mom wasn’t the only one who embraced this new time-saving appliance. I latched onto it too when my teenage sweet tooth took over and chocolate whipped cream-stuffed angel food cake and pineapple upside down cake became my specialties. This is what my mom’s Kitchen Aid looked like circa 1964. I received my first, very own Kitchen Aid at the ago of 23, as a gift from my grandmother who was proud of my culinary accomplishments from La Varenne cooking school. So this tribute is to you too, Grammy, a fine cook and wonderful Bohemian pastry maker who influenced my cooking style from early on. 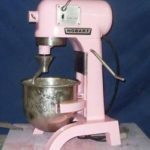 As a pastry chef, my Hobart, made by Kitchen Aid, was my best friend, cranking out Italian meringue by the gallon, kneading pounds of brioche and mixing tart dough for the next day’s pastries. It was the boss of the kitchen. Because I have a curious nature, I researched a bit more about this amazing appliance to see just exactly how it came to be. Here’s what I discovered. 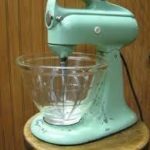 The first mixer was produced in 1919 by the Hobart Corporation and was called “the Hub.” It was designed by Herbert Johnston after observing workers making dough by hand and thinking there must be an easier way. 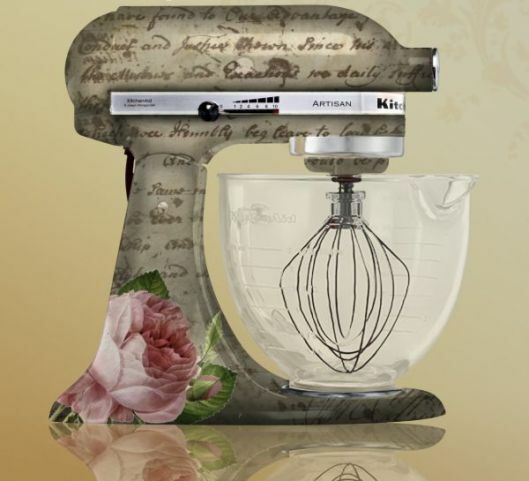 The Kitchen Aid continued to evolve, getting exposure in Good Housekeeping and Harper’s Bazaar. It was in vogue to own one of these time-saving machines. In 1955, five vibrant colors were introduced: Island Green, Petal Pink, Sunny Yellow, Antique Copper and Satin Chrome. Now you really wanted to invite the ladies over to see your kitchen! Cooking became a lot more fun! Color is not very appetizing! Talk about an appliance that transcends time. The style has changed very little and it has continued to be center stage for the home cook as well as the professional. I decided to write about this fabulous appliance because I have recently renewed my relationship with it. It sat in a cabinet with little use for years. Now that I have moved it to my counter, I am enjoying its power a couple of times a week. My Kitchen Aid inspires me to want to test just one more recipe and I’m having a lot more fun in my own kitchen! 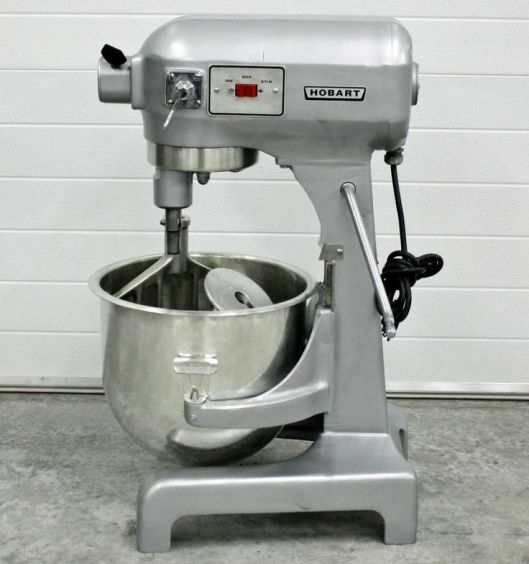 Do you have a favorite memory of something you created when your Kitchen Aid first joined your kitchen? Please share! Stay tuned next week for a recipe for Almond Meringue Rhubarb Cake. My mouth is watering just thinking about it! 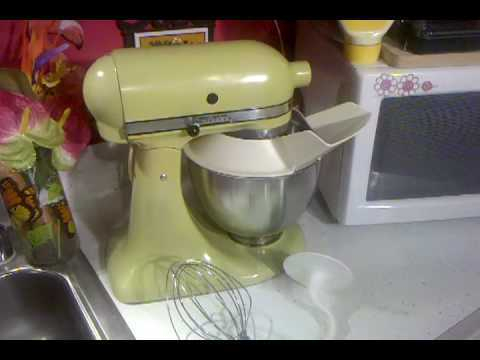 Click here to watch a great video on the history of the Kitchen Aid.